Raumfahrt+Astronomie-Blog von CENAP - Blog: Astronomie - UNLV Study Unlocks Clues to How Planets Form Astrophysicists discover a large population of potential young planets in distant solar systems. Astronomers have cataloged nearly 4,000 exoplanets in orbit around distant stars. Though the discovery of these newfound worlds has taught us much, there is still a great deal we do not know about the birth of planets and the precise cosmic recipes that spawn the wide array of planetary bodies we have already uncovered, including so-called hot Jupiters, massive rocky worlds, icy dwarf planets, and – hopefully someday soon – distant analogs of Earth. To help answer these and other intriguing questions, a team of UNLV and international astronomers has conducted the first large-sample, high-resolution survey of protoplanetary disks, the belts of dust and gas around young stars. Using the powerful Atacama Large Millimeter/submillimeter Array (ALMA) telescope, researchers have yielded stunning, high-resolution images of 20 nearby protoplanetary disks and given astronomers new insights into the variety of features they contain and the speed with which planets can emerge. The results of this survey will appear in a special focus issue of the Astrophysical Journal Letters (ApJL). Among the findings: UNLV first-year-graduate student Shangjia Zhang and astrophysicist/professor Zhaohuan Zhu led a study that used these ALMA features to discover that in other parts of our Milky Way there is potentially a large population of young planets — similar in mass to Neptune or Jupiter — at wide-orbit that are not detectable by other current planet searching techniques. The UNLV researchers additionally collaborated with the international astronomy team on all nine other publications in this special ApJL focus issue. Understanding how Earth was formed 4 billion years ago in our solar system is difficult because our solar system finished the planet formation processes long ago. On the other hand, we can observe young stars in other parts of the Milky Way where young stars and young planets are currently being assembled. Since these young stars are far away from us, we need powerful telescopes, like ALMA, to study these systems. “Understanding planet formation is related to understanding our origin,” Zhu said. When stars are young, they are surrounded by a flat disk made of gas and dust. These disks, called protoplanetary disks, are where young planets are born (that is also why planets in our solar systems are coplanar, lying in a common plane around our sun). Zhu compares finding young planets embedded in this disk to finding a pebble in a water pond. 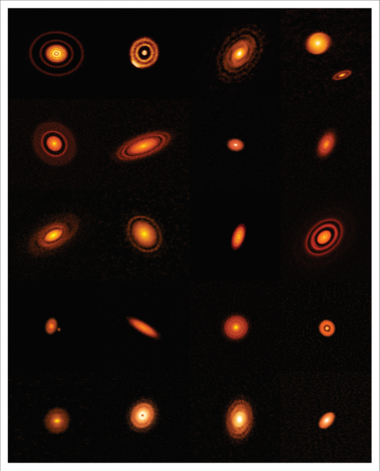 ALMA can detect tiny ripples and gaps in protoplanetary disks. “If these distant stars have young analogs of our Jupiter or Saturn, we have definitely caught them,” Zhang said. Zhang and Zhu carried out a large set of numerical simulations to study planet-disk interaction. Zhang analyzed 540 images from simulations to find the correlation between the width of the gap and the planet mass, and applied these relationships to observations to constrain the properties of potential planets in these disks. The collaboration — called the Disk Substructures at High Angular Resolution Project (DSHARP) — brought together top astronomers from around the world to study the relatively small-scale distribution of dust particles around 20 nearby protoplanetary disks. These dust particles naturally glow in millimeter-wavelength light, enabling ALMA to precisely map the density distribution of small, solid particles around young stars. For more information, visit the National Radio Astronomy Observatory site here. Video: Planet-disk interaction numerical simulation The planet excites spiral waves in the disk and later opens gaps. The leftmost panel is the gas distribution in the simulation. The middle two panels show the spatial distribution of dust particles in the simulation (small dust at the top panel and big dust at the bottom panel). The right panel shows the final synthetic observation that is generated based on numerical simulations. The synthetic images are compared with real observations directly.